International organizations provide food and clothes for the holiday to needy families in Israel, Russia, Ukraine. Ahead of Rosh Hashanah (the Jewish New Year), the International Fellowship of Christians and Jews (IFCJ) provided 28,000 gift baskets and 4,000 store vouchers to Jewish families in Russia and Ukraine. The families in question suffered financially during years of military conflict between the two countries and the resulting economic sanctions. The IFCJ teamed up with the Federation of Jewish Communities in the CIS (FJCCIS) to distribute the food baskets and store vouchers for clothing, The aid totaled over $1.6 million. About half the food baskets were distributed to children and young people, while the other half went to adults and the elderly. Approximately 10,000 baskets were donated in the Moscow area and 5,000 to Jewish refugees from the war-torn region of eastern Ukraine. These baskets totaled over $1.2 million. Another 4,000 store vouchers were distributed to families in distress in Jewish communities throughout the former Soviet Union. Each voucher can be used for the purchase of $100 in clothing. 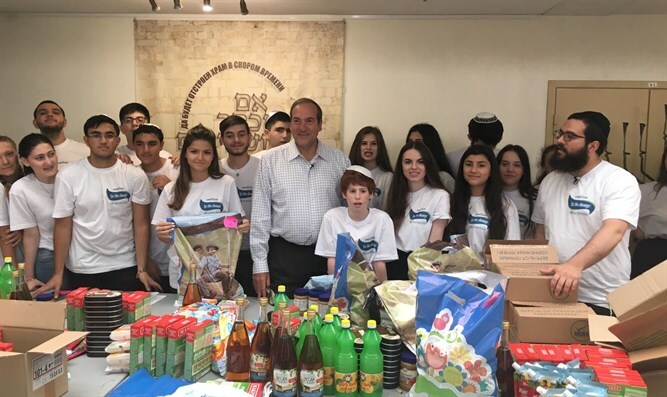 Last week in Moscow, IFCJ Founder and President Rabbi Yechiel Eckstein joined Russia’s Chief Rabbi Berel Lazar and a group of volunteers to pack thousands of the food baskets to send to the former Soviet Union. “This Rosh Hashanah, when we all sit around a table laden with delicacies, it’s vital that we recall our brothers and sisters in distress -- both in Israel and in Jewish communities around the world. At the Fellowship, we’ve been working for years to enable Jews in every place in the world to celebrate the holidays with joy and dignity,” Eckstein said. Aside from the help provided to Jewish communities in the former Soviet Union, the IFCJ led a major effort to help the needy for Rosh Hashanah in Israel, distributing food and clothing vouchers - to 39,000 needy families families throughout Israel. Other recipients include children in orphanages and welfare institutions, soldiers, and women in abuse shelters. The total aid to Israelis amounts to $2.28 million, or 8 million NIS. IFCJ distributed 8,500 vouchers to buy $85, or 300 Israeli Shekels, worth of food in the Shufersal supermarket chain to single-parent families living in public housing, and 5,000 vouchers to buy food for families participating in the National Program for Nutrition Protection. They also distributed 5,000 baskets and vouchers to buy food for families and the elderly living in poverty through Home and Hand in Hand Charity Organization. In addition, 8,300 vouchers worth $71, or 250 Israeli Shekels to buy clothing in the FOX chain of clothing stores were given to abused women and children in welfare settings. 12,000 grants for up to $142 (500 NIS) were given to lone soldiers and soldiers receiving assistance from the Israeli government.